ALAN MAYBURY is to stay with Hibs for the remainder of their mini-European tour after making a last-minute dash to join Pat Fenlon’s squad before the opening game of their four-match schedule, a 1-1 draw with Belgian outfit Lierse SK. 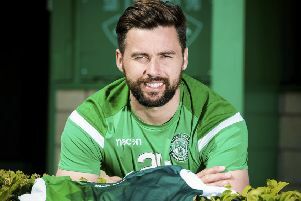 Having pulled on a green and white shirt in the weekend friendly against East Fife, the former Hearts star’s hopes of persuading Fenlon to offer him a deal on the other side of the Capital appeared dashed with the Hibs boss citing financial restraints. As such, Maybury wasn’t part of the initial party which flew out of Edinburgh Airport to a base in the seaside town of Vlissingen in the south-west of Holland on Tuesday morning, but, in a remarkable U-turn, the full-back reported to the team hotel less than 12 hours later. Although he played 32 minutes of last night’s match in Herentals, a few miles south-east of Antwerp, Maybury, who turns 34 early next month, will continue to feature, at least for the meantime, as a trialist as Hibs face another Jupiler League side, OH Leuven, on Saturday, and a Zeeland Select in Vlissingen on Sunday before flying to Germany to take on Union Berlin next Tuesday. It is understood Fenlon is keen to sign Maybury, who has also starred for Leeds United, Leicester City, Aberdeen and St Johnstone, not only for his experience but the fact he can play a number of positions, versatility being seen as vital within what will be a smaller squad than last season. Midfielder Isaiah Osbourne’s impending move to Blackpool would appear to have been the catalyst for the rapid change of events, the English Championship outfit’s boss Ian Holloway known to be a fan of the 24-year-old who he actually managed for a brief spell while in charge of Leicester. Hibs manager Fenlon said: “Alan flew in on Tuesday night and with Ozzy not coming on the trip it has left us a bit short. “Alan is a good, experienced player and one everyone knows I would like to bring on board. “We have other offers in for players but we may have to withdraw them and move on. Holloway took Osbourne on loan from Aston Villa in 2008 but he was recalled without playing a game due to an injury crisis at Vila Park. Blackpool are currently in the Algarve preparing for their new season but Holloway is being kept in touch with how negotiations are developing with a bid said to have been made although it is understood claims the figure involved is £250,000 are wide of the mark. Meanwhile, Hibs’ Under-20 side clinched their place in the semi-finals of the Foyle Cup with a 4-0 win over Arklow Town, their goals coming from Jay Doyle, Jordon Forster, Dean Horribine and Euan Smith. The young Hibees face Finn Harps today.